After a very successful showing at the 2019 Philadelphia Regionals with a 2nd place finish from Andrew Burley and Top 8 finish from Kyle Livinghouse, more players are looking at Ho-Oh and trying it out. Thanks to its great bulk, typing, and offense which you will learn about in this article, you'll learn about why Ho-Oh saw great success in Philly and why Ho-Oh is a Pokémon you should respect. Pressure – "If this Pokémon is the target of an opposing Pokemon's move, that move loses one additional PP." A more standard ability for legendary Pokémon, Pressure is always a helpful ability as being able to drain the PP from your opponent's attacks is always helpful. Bulky Pokémon especially will enjoy Pressure as it gives them a better chance to win the 1v1 against an opponent. Its special bulk is amazing. 106 HP and 154 Sp. Defense means if it's not a super-effective hit, Ho-Oh should take it pretty comfortably. 90 Defense isn't amazing but with the high HP stat, Ho-Oh will still take attacks relatively comfortably. 130 Attack and 110 Sp. Attack are both solid, but the attack stat is what more Ho-Oh players will trend towards. Thanks to its high attack stat, Ho-Oh can threaten some major damage. 90 speed isn't amazing as it puts it on the same speed tiers as both Groudon and Kyogre, but Ho-Oh won't use its speed for the most part outside of speed control. Fire/Flying is decent. 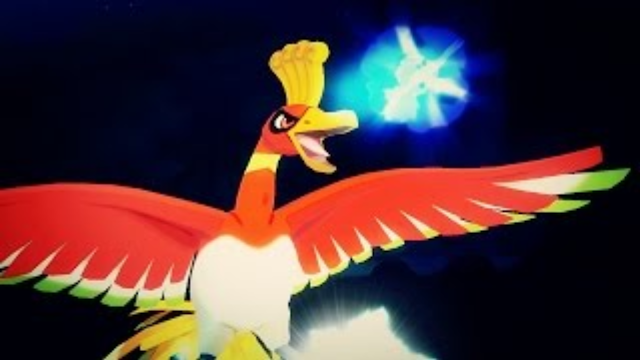 6 resistances in Fighting, Bug, Steel, Fire, Grass, and Fairy of which the last 3 are much more common can make Ho-Oh a solid switch-in to common Pokémon and attacks. Weakness to Electric, Water, and Rock are annoying as Water is very common mainly because of Kyogre, Electric because of Tapu Koko, and Rock because of Stakataka, all of which are very common Pokémon in the format at the moment. These are the 8 moves you should expect on Ho-oh in order of importance. Brave Bird and Sacred Fire are your best-attacking moves. Brave Bird is great for the grass types like Ludicolo that aren't weak to Sacred Fire while Sacred Fire is great for the 50% chance to burn. Recover is your best move to regain HP. You can use Roost, but Roost removing your flying typing isn't fun when Groudon could use Precipice Blades that turn and possibly KO your Ho-oh. Tailwind is your speed control option which is great to use to help your partner Pokémon get what they need to be done. Used by Kyle Livinghouse, Toxic is great to slowly wear down a Pokémon you can't KO with your attacks to stall them out. Protect is the best move in VGC and can work well with Ho-Oh. Whirlwind is great for phasing out some Pokémon that either try to set-up or use Trick Room. The final one in Substitute is more niche but can work well with Ho-Oh to take advantage of its amazing bulk. Ho-Oh's moves all play into its amazing bulk. The Aguav and Figy berries work well since when Ho-Oh drops to 25%, it regains 50% health to allow it to survive other hits to make it hard to take out. Electric Seed works well with Tapu Koko since most of the moves Ho-Oh will take are physical Rock-type moves like Rock Slide and Stone Edge which means with the +1 Defense, Ho-Oh can take these attacks much better and even survive attacks it otherwise couldn't. The final one in Leftovers is great for the smaller health you'll gain each turn which over time, will be better than the berries since Leftovers is much more guaranteed to work in your benefit. The first Ho-Oh set is a more standard bulkier attacker. The goal is to either attack, heal, or support its team members with speed control. The EV Spread plays into allowing Ho-Oh to survive multiple hits, such as -1 Staktaka's Rock Slide and +2 Modest Xerneas' Dazzling Gleam is a 5HKO. The speed stat hits 118 which under Tailwind (hits 236) hits can outspeed Timid max speed Scarf Kyogre which hits 234 speed stat and any Pokémon that outspeeds that specific Kyogre. The moves are very simple. Brave Bird and Sacred Fire are your main means of offense. Thanks to both moves, zero grass types are safe from your Ho-Oh since the ones that can take Brave Bird are threatened by Sacred Fire and vice-versa. Recover is your main way of healing if the berry has either already activated or Ho-Oh isn't in range to use it. Being able to regain health is crucial for any Pokémon that has the opportunity to do so. The final slot in Tailwind is a speed control option every Pokémon enjoys. Being able to outspeed a Pokémon any either KO or deal a large amount of damage is great for any Pokémon that can abuse the opportunity. The second set is a more supportive set that is based on the one used by Kyle Livinghouse (@AnimusVGC) to finish Top 8 at the 2019 Philadelphia Regionals. The idea of this Ho-Oh is to be a much more supportive variant meant to slowly wear down its opponent. While the EV Spread still accomplishes the same goal as the first one as it hasn't changed, it doesn't need to change thanks to Ho-Oh's amazing bulk. The moves are simple. Sacred Fire is your main ways of dealing damage. Toxic is great to slowly wear down a Pokémon that Sacred Fire can't deal with, although Pokémon like Heatran can wall your Ho-Oh, but thankfully Heatran can barely damage Ho-Oh. Recover is great to regain health very easily. The final slot is either Tailwind for the speed control or Protect to buy an extra turn for your Ho-Oh. Since Ho-Oh hates fighting Kyogre, Ludicolo can help with Fake Out pressure and use Grass Knot to threaten a KO on Kyogre. Ludicolo can also threaten the Rock types Ho-Oh doesn't like fighting. Kyogre appreciates how Ho-Oh is able to effectively deal with the Grass-types Kyogre hates fighting. Pokémon like Ferrothorn and Tsareena absolutely hate Ho-Oh since they can't touch it for much damage. Since Ho-Oh absolutely hates fighting Water-types, these 3 in Ludicolo, Kyogre, and Palkia can use there very powerful Water-types moves to threaten Ho-Oh. Keep in mind that Ludicolo is threatened by a super-effective Brave Bird while Kyogre and Palkia don't necessarily enjoy taking a Brave Bird as well. Ho-Oh also hates fighting Rock-types such as Stakataka who can easily use Rock Slide or Stone Edge to KO Ho-Oh. Thanks to its bulk, Stakataka can take a hit, set Trick Room, and then try to take Ho-Oh out. Keep in mind that the 50% chance to burn Stakataka from Sacred Fire isn't something Ho-Oh will enjoy. Ho-Oh's other weakness to Electric-type moves means Pokémon like Tapu Koko and Zekrom can threaten Ho-Oh for super effective damage. Tapu Koko can use either Thunderbolt or Wild Charge although Sacred Fire can do massive damage to Ho-Oh. Zekrom's Bolt Strike can easily KO Ho-Oh if not affected by Intimidate.